There's no shortage of things to do in St. Louis. Many of the top attractions in the city are free, including the St. Louis Science Center. It's one of only two science centers in the country that offers free admission to all guests. The science center focuses on hands-on learning with exhibits, experiments, and classes showcasing many different kinds of science. It's located at 5050 Oakland Avenue in Forest Park. From I-64/Highway 40, take either the Hampton or Kings Highway exit. The main entrance is on Oakland Avenue about four blocks east of Hampton, or a half a block west of Kings Highway. It's open Monday through Saturday from 9:30 a.m. to 4:30 p.m., and Sunday from 11 a.m. to 4:30 p.m. Be sure to check before you go, sometimes its hours vary due to weather or other circumstances. A group of St. Louis philanthropists founded the Academy of Science of St. Louis in 1856, which included a museum space to display their personal collections of artifacts. By 1959, it had become the Museum of Science and Natural History. The St. Louis Science Center has more than 700 exhibits spread out over several buildings. On the bottom level of the main building, you'll find life-sized, animated models of a T-Rex and triceratops, a fossil lab and exhibits on ecology and the environment. There's also CenterStage, where visitors can watch free demonstrations and experiments about science. The middle level of the main building has the primary ticket windows, Explore Store, Kaldi Cafe, and the entrance to special exhibits. The upper level of the main building has the Discovery Room, MakerSpace exhibits, the OMNIMAX theater entrance and the bridge to the Planetarium. Named for benefactor James Smith McDonnell (of aerospace company McDonnell Douglas), the Planetarium opened to the public in 1963. It's located just north of the main science center building across Highway 40. Take the elevated, covered bridge from the upper level of the main building to the Planetarium. On the way, you can learn about bridge construction, use radar guns to track speeders on the highway, and practice your skills as an airplane pilot. Then, make your way into the Planetarium for an adventure in space. There's the StarBay with exhibits on the mission to Mars and what it's like to live and work at the International Space Station. Or, learn about stars and see the night sky like never before at The Planetarium Show. 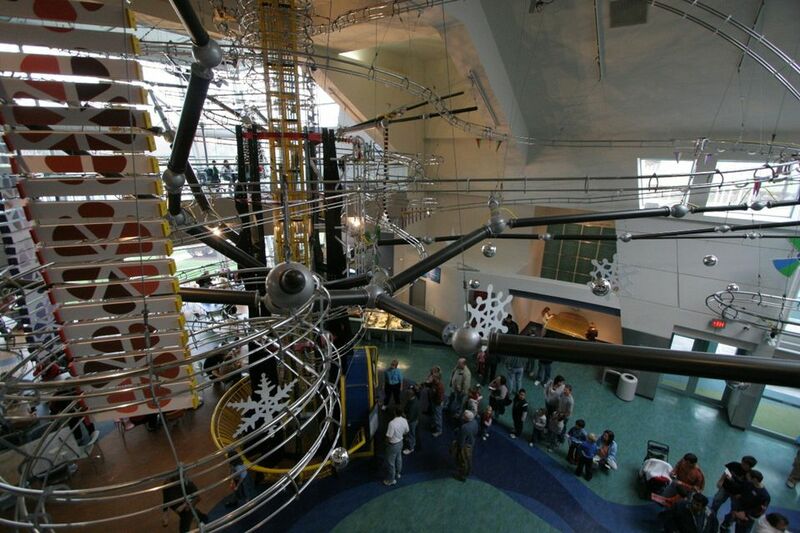 This 13,000 square foot space replaced the Exploradome in 2011 and hosts the science center's traveling exhibits. The Grow exhibit, a permanent indoor-outdoor agriculture display, opened in 2016. While admission and most exhibits at the Science Center are free, there are some things you'll have to pay for. There is free parking at the Planetarium, but there's a fee for parking at the main building. There's also a fee for tickets to the OMNIMAX theater, the Discovery Room children's area, and for special exhibits.